I promised in a previous post on my Island Hopping escapades that I will be providing Island-hopping information, tips, reminders, maps and costing guides—things that aren’t easy to find on the Web. Good thing I’ve had ample time today to make good that promise, and cook up this “helpful” post based on my family’s time-tested Island-hopping recipe. I hope this could be of help to readers or their friends who are planning to embark on an adventure cruise in and around the Davao Gulf. I am open to suggestions, additions, corrections and criticism. Drop me a comment or send me an email via the About page. Commercial Island-Hopping Packages. For a maximum of convenience, contact any of Davao and Samal’s Travel and Tour Agencies, Resorts and Hotels for offerings. Standard Island-Hopping tours already include full-day (8-hour) boat rentals, a tour guide, individually packed lunch, complimentary bottled water, the standard 5 sets of snorkeling gears, and one kayak or banca (oar-driven mini-boat). These packages take you to at least three major stopover points and normally cruise on the Western Davao Gulf area—the part closer to Davao City. Rates usually start at Php 15,000 (USD 366) for 20 persons. Prices can go up or down depending on the number of passengers. Boat Rentals. The Sta. 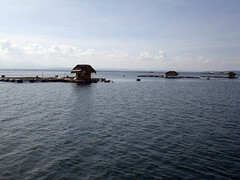 Ana wharf is host to Davao’s island-hopping boats. Go to the wharf at most one day before the scheduled tour date and take your pick among the launches docked in the area and make arrangements with the boat owners or crew. A 30 to 40-capacity boat will cost you around Php 4,000 to Php 6,000 (USD 98 to USD 147). A 90-seater will cost around Php 9,000 (USD 220). Make sure you set everything straight with the people you’re dealing with, including the price and the amenities included. I would suggest you take a boat with a lot of breathing space for everyone. So, If there are 20 of you coming aboard, rent a 30 or 40-seater so you don’t get crammed in. Remember that you would be bringing food, bags, equipment and what-have-yous. Now, you wouldn’t want to go around in your two-piece suits with uncanny bag dents on your legs, would you? Choosing the Right Boat. Making the perfect boat choice depends on the kind of activities you want to do on your Island cruise. If you intend to bring a banquet or buffet-style lunch on board, a boat with the seats trailing the sides of the boat and with a long table running in the middle would be great. Built-in amenities and facilities can also count toward your choice. Some boats come equipped with a dressing room, toilet, view deck, kitchen, and barbecue grills for on-board barbecues. Some even have karaoke machines installed. Yet, others have little bedrooms for resting. The larger boats come equipped with a kayak or banca (mini-boat with oars). Snorkelling sets may be available for rent, or may come free, depending on the arrangements. SCUBA gears can be brought aboard, but they entail separate arrangements from diving shops in Sta. Ana wharf. Maritime Safety Compliance. Safety and seaworthiness should be on top of island-hoppers’ priorities. Make sure that the boat and its crew comply with rules and regulation on maritime safety, including but not limited to having the requisite licenses and permits. All boats must have life vests and fire extinguishers on board. Larger boats must have a small “rescue ship” in the form of bancas or mini-boats. It is very important to ensure that you are taking a boat with capacity more than the number of persons joining the tour. This adds not only safety, but also comfort to your Davao Gulf experience. Route, Destination and Timing. A full day on a boat sailing aimlessly on the vast Davao Gulf would be like walking the Louvre in a blindfold. Without a well-defined route, you will only be missing the treasures that Davao Gulf holds. To avoid a misfortune of this sort, discuss your plans ahead with the boat crew, touching on the route, stop overs or destinations, with a mental note on the kind of activities you would want to do at each point. 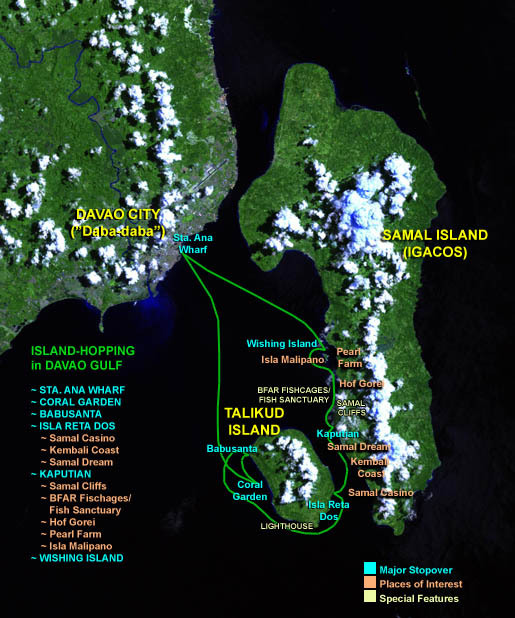 Be sure to set the details straight, whether you head for Talikud in the morning then trail Samal Island’s west coast up to the Malipano islets in the afternoon, or go a different route sailing past Samal’s northern tip to the Ligid islands or up to Canibad (Aundanao) on the other (eastern) side of Samal and back. Make ready reference to the time of day you will be reaching each point on the tour. For instance, if you opt for the western route and head off first to Talikud, Lunch may be had on the boat at Coral Garden or you can partake of your meals on board beached in Babusanta (you can also take your lunch in one of the large, open cottages on the beach), so on and so forth. Remember that the full-day cruise lasts 8 hours, so plan all your destinations and activities well within this time frame. You can also solicit suggestions from the crew. They probably know more about the Gulf than we urban heads ever will. Tips, Food for the Captain and Crew. Perhaps on a humanitarian note, it would be advisable to give minimal tips to the boat crew. You may also provide food for them because they can’t risk leaving the passengers in the middle of the Gulf to get lunch at Jollibee or McDonald’s. Well, to prevent that from happening, you may bring packed lunch for them from, uhh, Jollibee or McDonald’s. Reminder. Everyone knows that littering not only contaminates the surroundings, but also harms nature and damages ecosystems. The Davao Gulf in particular, rich as it is in marine resources, providing food, and livelihood, as well as tourism to the Davao Region, must be kept clean and guarded from the harmful effects of littering and pollution. Hence, all of us, be we tourists or locals, must take on the responsibility of properly disposing our garbage. To island-hoppers, it is advisable to keep plastic bags where they could keep their garbage. In the case of small or dry garbage items like candy wrappers, they may be kept in one’s bags or pockets for later disposal into the garbage bins in the city. Enjoy! Island-hopping is all about fun and adventure. It takes you away from the struggles of urban existence and allows you to drift off to experience the beauty and wonders of nature. That’s the tried and tested relief that Dabawenyos are lucky to live so close to. « WordPress reaches Five, Jai gives out Five plus One. on what day is it best to go island hopping? it’s been a long tym since i’ve done it.. Weekdays and non-holidays would be great for Island-hopping because the beaches and resorts are not crowded. So you wouldn’t have any problem finding a suitable place to “beach” your boat. It could get frustrating if you find too many boats “parked” on your favorite beach on a weekend or holiday. By going out on “non-peak” days, it would seem you have Davao Gulf all to yourself. well island hopping is sure fun lalo na sa Samal Island. you have a nice blog, keep on posting man. hope mas marami pang pinoy ang maka appreciate sa sarili nating place. we don’t have to be strangers in our own country. so thanks and good luck! hope ilagay moko sa blog roll mo. thanks bridex. hello, this is great information, thanks for sharing it to the world. I would like to know where to rent the 90 capacity boat for only 9,000 mentioned here? maybe the price has gone up a bit these days but it’s still cheaper compared to others i’ve asked. Hey mel! Sorry for this belated response. You can go to Sta. Ana wharf anytime and see if you’re lucky to haggle a good price for boat rentals. 🙂 Better yet, some boat crews give out the operators’ phone numbers, so you can negotiate directly with the owners. cno pwd macontak sa island hopping? pls i ned help…cgroi ms mura kng 12 persons lng? The est cost of food is 6,000 pesos, did the boat owner prepare the food for you? so the actual cost was the food and boat rental, right? or did anybody cater it for you?…the price on food and drink are very reasonable. excellent blog…good job! eii ask lng aq.. san kau nagpabook..? kasi di q lam kung san magpabook kung mag-island hopping kami.. thanks.. Sorry for not checking this blog as often as I want, and for not replying to all your comments soon enough. Here’s a reply i made to ms. may on another entry, which I am pasting on here for your guidance. Happy island hopping everyone! 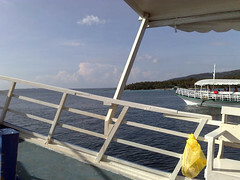 The last time I island-hopped in Davao was sometime in September 2010, or about a month ago. We didn’t avail of any island tour packages. We just went straight to Sta. Ana wharf and rented a 45-seater for 8,000. It looks like boat rental prices have gone up since i posted my island hopping article (May 2008). We rented the boat for one whole day but we opted to stay on one popular beach–Isla Reta–on Talikud island. The boat was parked at Isla Reta for the rest of the day (till around 5pm). Although we could have gone to some other spots if we chose to, we just saw no need for that because we brought along other watercrafts that we used to get to other places on Talikud Island (I went scuba diving at the Coral Garden near Babusanta Beach–PERFECT!). At P8,000 for a whole day boat rental, and with around 30 people on board, that was already a good bargain. You just have to spend more for food, drinks, et cetera, again, depending on your budget and needs. Hope this helps! Enjoy your island hopping! By the way, those asking about food: the food we bring on our cruise are all prepared at home or bought from some other place. I think it’s cheaper that way, but may be a little taxing if you had to prepare them yourself. To go convenient, you can buy cooked food at restaurants, drinks and fancy snacks at convenience stores or the groceries. There are restaurants offering packed lunch at reasonable prices. A lot of restaurants dot the Chinatown area, which is where the Sta. Ana wharf is located. You can even buy a good sized lechon for under 3,000, also in Chinatown. I really love island hopping, am checking for my next destination and very much like reading here. I hope you can help me with my itinerary for 3 days, the best place to go for a short period of time. Thanks a lot, Godbless. Hi, i am planning to organise à trip for my guest staying in pearl farm, is it possible for us to be pick up and bring back to pearl Farm after the day? We are around 20 people. If you could also send me a photo of the boat. Thanks, hope to hear from you guys soon. Be blog so far. Very detailed and staight.